Courtesy of Eminem’s InstagramAfter premiering a short teaser on ESPN’s College Football Prime Time on Saturday night, Eminem has released the full-length video for his brand-new single “Berzerk.” The cut serves as the lead single off his forthcoming album, The Marshall Mathers LP 2. 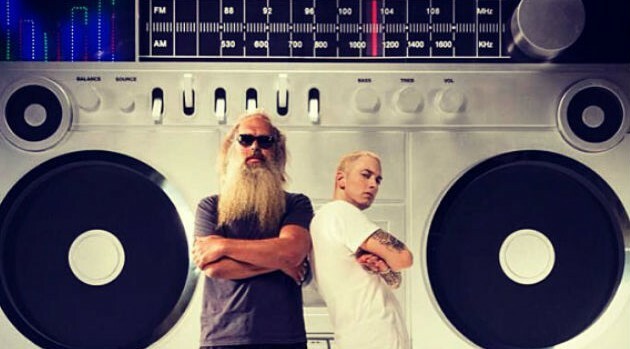 In the clip, directed by Syndrome, Slim Shady has dyed his hair back to blonde and kicks it old school alongside special guests Kendrick Lamar, Kid Rock, Slaughterhouse, Rick Rubin, Mr. Porter and more. Watch it now via Eminem.com. With contributions from executive producers Dr. Dre and Rubin, fans can anticipate The Marshall Mathers LP 2 in stores on November 5.